Camping chairs are essential if you’re planning a long trip. 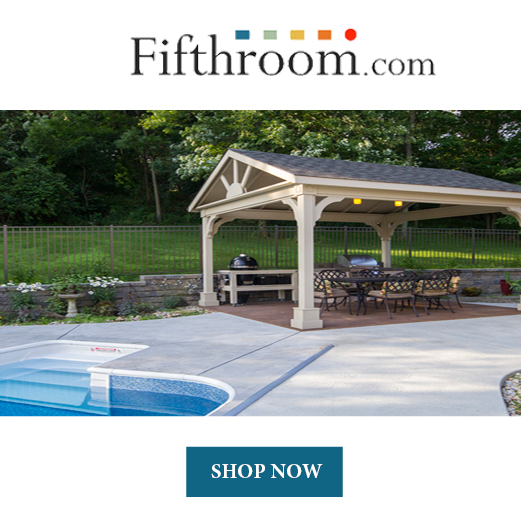 You need somewhere to put your feet up and take a load off. Sometimes camping chairs can get expensive or maybe they don’t have everything you’re looking for. 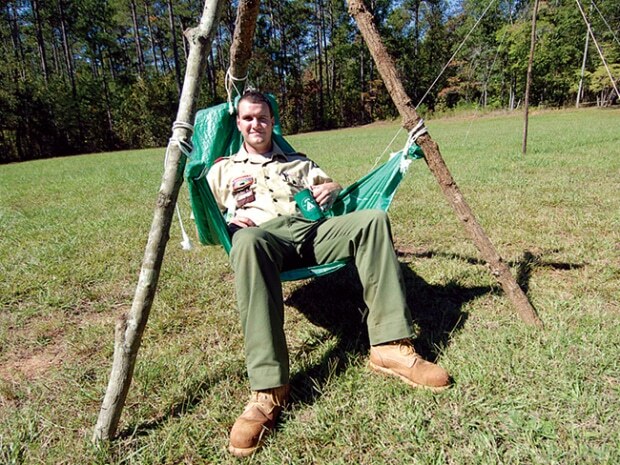 So why not try to make your own DIY camp chair? They’re lots of fun and you’ll be able to enjoy your camp chair that much more because you made it. There are tons of choices and options you can choose from! This article will help you narrow it down by giving you a couple of clever ways to make your own DIY camp chair. This is such an easy idea. 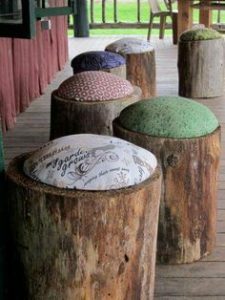 Simply carve a seat into a tree stump! You’re done! Or just put a cushion on top of a tree stump and leave out the carving. The tree stump can be still in the ground, or it can be a portable tree stump. Tree stumps that are still in the ground are good for around a fire pit, but you won’t be able to take it anywhere else. A portable tree stump chair is good for weekend trips or small getaways. 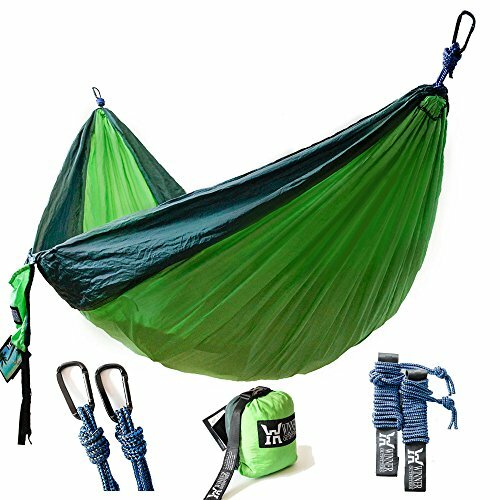 You definitely don’t want to lug around a big tree stump if you’re planning a long backpacking trip. This is a fun idea for an overnight trip. Tree stumps are sturdy and stable and won’t blow over in the wind. They can also be surprisingly comfortable! Use a tree stump chair for a unique looking DIY camp chair. 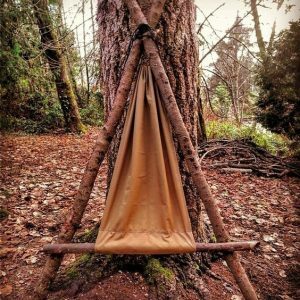 This DIY camp chair is a little more complicated to make than than the tree stump chair but it’s still an easy way to get a great place to sit. You’ll need to sew to create this chair, so access to a sewing machine is a must. This doesn’t take a lot of time, but you’ll need to make sure you don’t rush through it and get it messed up. Use three long, wooden poles that are at least your height and 2 inches in diameter. Tie them together in the shape of a triangle, or teepee. Make sure that the it’ll be secure! Next you’ll need some strong fabric like canvas. There aren’t exact measurements on how big the piece of fabric needs to be, so you’ll have to estimate how big of a size you’ll need. It should be wide enough so your hips can fit on it comfortably. The fabric should be a long rectangle. At one end of the rectangle, sew a strong cord into the fabric. At the other end of the rectangle, sew a sleeve and put a shorter wood pole into the sleeve. Or you can buy a piece of fabric that is already suited to make this kind of camp chair. Then put the strong cord over the top of the teepee you made earlier and sit down into the fabric, a chair will be formed! Little ones need little chairs. Make your kids feel extra special with their very own camp chair. These little camp chairs are made from PVC pipe and your choice of fabric. Since smaller people will be sitting in these chairs, the fabric doesn’t need to be quite as heavy duty, but it should still be able to hold some weight. Bring your kids along to help you pick out a fabric that they love. PVC pipe is super lightweight so it won’t be too heavy to carry along on a trip, but it’s probably best for a short trip because it doesn’t fold. It’s relatively simple, although the exact specifications differ depending on the tutorial you see. Get PVC pipe at your local home improvement store. You’ll need the pipe and some T’s to hold the pipe together. It’s sort of like legos, build a chair using the PVC pipe in any way you’d like. All you need to do with the fabric is sew it around the pipe and have your kids sit in it. It may not make total sense now, but it’s super easy! There are some great YouTube tutorials if you get confused. Your kids will have fun helping you and it’ll be even more fun when they get to take their chair with them on vacations or camping trips. Nowadays there are so many fun fabrics available that each child can have exactly what they want. You can even spray paint the PVC pipe to be a color that matches the fabric, or it doesn’t even have to match. Sometimes just letting the kids choose what they like is a lot more fun for them. Try doing more DIY projects instead of going to the store to buy things. Yes, there are things that you should buy from the store that you probably couldn’t make yourself. However, DIY projects are a good way to bring the whole family together and learn how to make something with your hands. It’s important to let kids use their imagination and be creative. DIY kid projects lets kids have an outlet for all their creativity. 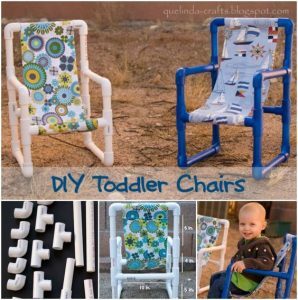 DIY camp chairs are a great place to start it you’re a beginner. They’re easy and really fun! Your kids will learn how to problem solve and still be able to create something that they’re proud of. There are a lot of valuable lessons that come from making things yourself. Not all, but most DIY projects are cheaper than buying the same product in the store. People who want to save money should think about all the things that they buy in the store and how many of those things they could make for much cheaper. Materials are usually pretty cheap, but the labor is what makes a store bought product more expensive. Buy the materials and make something yourself and you’ll save a lot of money. These clever ways to make your own DIY camp chair are all great to make. They are simple enough for beginners but advanced enough so that more experienced people won’t get bored. Your next camping or backpacking trip could be full of fun camping chairs that you made yourself. How fun would that be? Your kids would all be sitting in their own camp chair with the fabric that they picked out, and they’d love it! 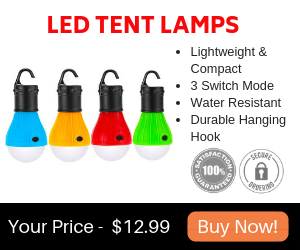 Camping will be so much more fun now because you’ll be able to show everyone what you made. Look no further for a fun, DIY project that you’ll keep on using. These DIY camp chairs will last for plenty of fun family adventures. Hopefully when your kids are grown, you’ll still be able to show them what you made, then they can teach their kids how cool it is to make DIY camp chairs. It goes round and round!